You can minimize file-compatibility issues by standardizing on the most common file formats. By default, OpenOffice.org saves files in Open Document Format (ODF). Microsoft's by-the-book support for ODF, unfortunately, breaks some spreadsheet files, according to a recent ZDNet blog post. Step 4. 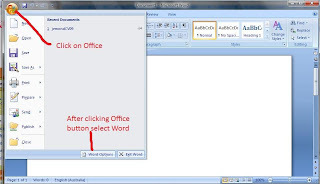 Choose Microsoft Word 97/2000/XP in the Always save as drop-down menu and click OK. Step 2. Choose Microsoft Excel 97/2000/XP in the Always save as drop-down list and click OK. If you are using Microsoft Office 2008 but you send these documents to someone they mostly complain that they are still using Microsoft Office 2003 and they are having problem opening the file, here is the interim fix until Microsoft Office 2008 is widely deployed and accepted. 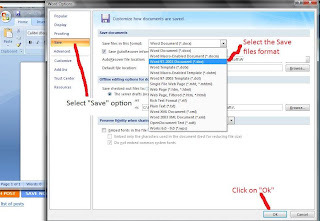 After selecting word options, click on "Save" options and then select "Word 97 - 2003" format from "Save in this file format" drop down option, as illustrated in below picture. Repeat the same steps for Microsoft Excel 2008. Once Microsoft Office 2008 is widely accepted, you can repeat the similar steps and select .docx format as your default file saving format.